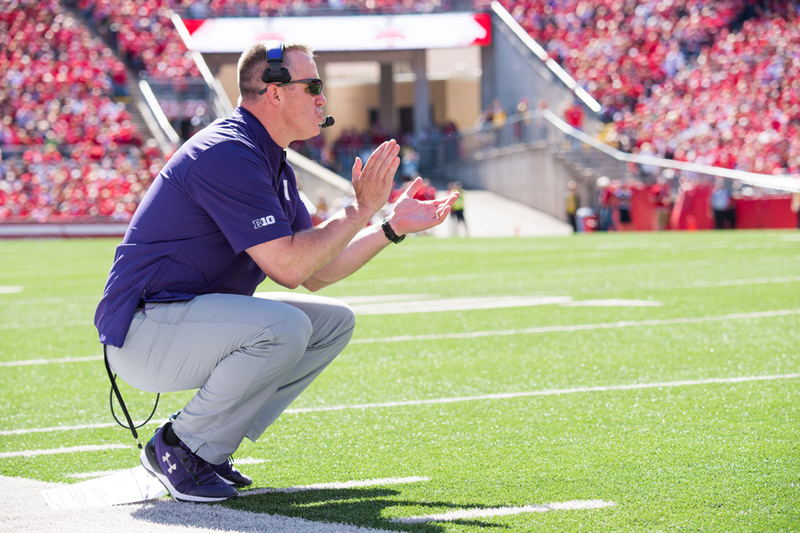 Pat Fitzgerald coaches from the sideline. Fitzgerald said he was optimistic about the upcoming football season, despite a tough schedule. Pat Fitzgerald expressed confidence in the state of his program on Monday, the first day of Big Ten Media Days in Chicago. The 13th-year coach said Northwestern is carrying momentum into the 2018 season, and that the team should get a boost from practicing at the brand-new Ryan Fieldhouse, which opened earlier this year. The Wildcats ended 2017 on an eight-game winning streak, the longest in Power Five conferences. NU’s 2018 schedule is tough, however, starting with a conference game at Purdue on Aug. 30. The game will mark the Cats’ first regular-season contest not on a Saturday since 2007, and their first time opening on a Thursday since 2004. Fitzgerald gave a little insight into senior quarterback Clayton Thorson’s health, telling ESPN that Thorson’s “goal is to play in the opener,” although he added the team has “always erred on the side of being … a week late” in pushing players back from injuries. Thorson tore his ACL in the Music City Bowl last December; the team has been noticeably mum about his status ever since. Asked about a standardized injury report given the expected expansion of legalized sports betting, Fitzgerald said he would support such a policy, so long as other teams reported accurate information. The Cats have been notably reticent to release injury information under Fitzgerald; he almost never answers questions about missing players. Fitzgerald extensively discussed NU’s academic success, as the Cats earned the top Academic Progress Rate in the FBS last year. He also emphasized that the new facilities are a game-changer and give NU an opportunity to take that elusive next step: winning the Big Ten West. The Cats have never appeared in a Big Ten championship game and have not won a conference title since 2000.